Kussmaul Seeds sells seeds in 13 states through sales managers, dealers and distributors. Kussmaul Seeds remains an independent seed company. Our seed is available in Wisconsin, Illinois, Minnesota, Iowa, South Dakota, Nebraska, Montana, Wyoming, Idaho, Washington, Oregon, California and New York. Contact our salesperson closest to you for more information or to place an order. Duane Laufenberg – I’ve tried other brands, but now I plant 100% Kussmaul Seeds. I just like it a lot better than the others. It has been a good corn for years. Kussmaul Seeds roots go back over 85 years to 1934, when Rud Kussmaul planted one acre of seed corn to sell to a few neighbors for extra spending money. When Rud found an increasing interest in hybrid seed corn, he asked his brother Al to join him as a salesman. This was the start of Kussmaul Hybrids. Through the years, as demand and sales increased, Rud focused on production, and Al was on the road as the salesman. In addition to hybrid seed corn, the company sold seed oats and succotash. Farmer dealers were recruited through newspaper ads, fairs, and word of mouth. By 1981, Kussmaul Hybrids had sales in 13 states and had outgrown their production capacity; the brothers were now in their sixties and none of their family members desired to continue the business, they decided to sell the retail segment of Kussmaul Hybrids, and continue with the farming and production segments. This decision seemed to make more economic sense than to spend millions of dollars constructing a new processing tower and additional warehouse space. Also, with one brother concentrating solely on production and the other on sales it was time to do some estate planning for the future. In 1983, Al’s daughter married Paul Klinkhammer, who began working for the brothers in their farming and seed production operation. Through the 1980’s, Paul learned about hybrid seed corn production and about sales while selling seed oats to local farmers and retail stores. These same customers kept asking why Kussmaul Hybrids had discontinued seed corn sales and would they be resuming them. Then 1988 hit us! The drought! In 1988, the company that Kussmaul had been growing seed corn for decided they had better get more of their seed production under irrigation. They ended their contract with Kussmaul. This was Kussmaul’s opportunity to get back into retail again and the birth of Kussmaul Seed Company. Now with Paul running production and Al continuing with sales, a new sales force was built. Many of our old customers rushed back, some as customers, some as dealers. As sales grew, district and area sales managers were added. Products were also added: alfalfa, soybeans and forage seed. We purchased a large seed production facility previously owned and operated by DeKalb and just 75 miles away from our office and home farms. 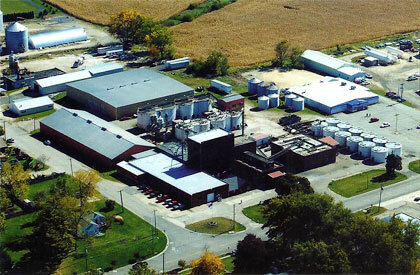 Prior to the 2002 purchase, Kussmaul Seed had been using the facility exclusively since 1989 . Not only do we process our own seed, but we also provide drying, shelling, grading, bagging and re-bagging for several other seed companies, nationally and internationally. The Warren seed plant was originally built and operated by DeKalb with continuous upgrades throughout the years. Kussmaul uses sweet corn huskers to remove husks, as they are much more gentle on the seed corn than conventional seed corn huskers. All dryers are equipped with computerized climate controls to monitor temperature and reverse air flow. Single pass dryers dry and remove moisture all from the bottom up or top down. Reverse flow dryers, like ours, allow us to partially dry the seed from the bottom up, then change air flow, and continue drying from the top down. This concept keeps the bottom from getting over-dried, and the top under-dried. The facility also has a heated conditioning tower, two separate treating lines, and our own in-house lab.